And Traditionis where material meets potential and function intersects form. This Danish design collective seeks to bridge the gap between industrial processes and traditional crafts. Whether it is reshaping, reinventing or redefining contemporary design, And Tradition believes that the future lies in creating products that are meant to last. Raw materials are turned and twisted like the legs and stools of the Raft series or one of the many selections of lighting: Milk Blanc is clever, aesthetic and affordable. 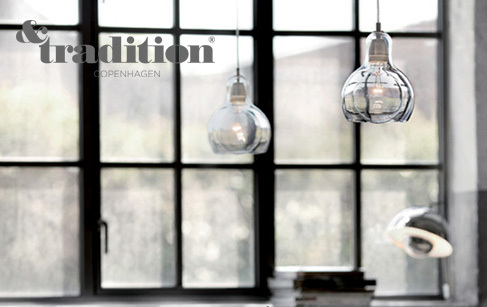 The Bulb series is elegant, pure and even won the Good Design Award in 2001, created in Chicago in 1950 by Charles and Ray Eames, Eero Saarinen... and recognises innovation and originality for extraordinary consumer and product design from all over the world.